Wildfires raged over a large portion of the mountain sides and hills within the McDowell Mountain Park in July of 1996. Although lightning sparked the blaze, human activity was responsible for much of the extent and severity of the burn. Before establishment of the park this area was rangeland heavily grazed by cattle which encouraged an extensive woody shrub layer ... shrubs such as catclaw acacia and foothill palo verde that cattle tend to exclude from their diet. When the park was established in the 80's the soil crust was disrupted almost everywhere and there was an abundance of invasive weed seeds built up in the soil: red brome grass, london rocket, buffel grass, filaree and mustards. A moist winter spring was followed by intense drought leaving conditions ripe for wildfire: plenty of standing dead wood from excessive shrubs and an abundance of dried weeds and grasses. In human terms this tragedy will take several generations to overcome. Even now after twelve years, scorched saguaros stand as reminders. Other saguaros, still alive, are battling chronic infections that invaded through burn wounds. But on nature's time scale the succession is proceeding rapidly with brittle bush leading the way. On Lousley Hill in December 2002 entire hillsides were densely covered with 40 to 60 cm tall brittle bush shrubs - spring time in this area will, as a result, be brilliant yellow with all of the flowers. Many other shrubs and trees are also regenerating well, some having sprouted from fire-resistant root crowns. 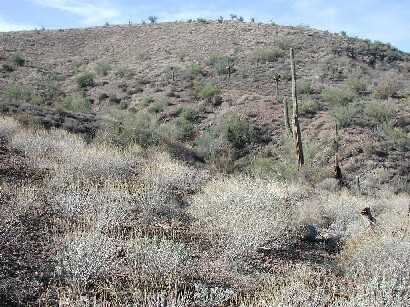 Jojoba, foothill palo verde, and ratany were all found with vigorous regrowth. This regrowth is aided in part by the fertilizer contained in the ashes left by the fire. The main entrance to McDowell Mountain Regional Park, part of the Maricopa County park system, is off McDowell Mountain Road four miles north of Fountain Hills. It is a large park covering 8538 hectares. There are many trails, picnic areas and camping. A 24 km loop trail through the flat desert area is very popular with mountain bikers. Mountain bikes are not permitted on the Lousley and Scenic Trails. There is a $6 per vehicle entrance fee. Maricopa Parks Information Link. View Larger Map. Directions: From Phoenix or Scottsdale drive east on Shea Blvd. to Fountain Hills. At Fountain Hills drive north on Fountain Hills Blvd. which turns to east and then becomes McDowell Mountain Rd. Park entrance is 7½ miles north of Shea. From the East Valley drive north on Bee Line Hwy. to Shea and turn west to Fountain Hills Blvd. 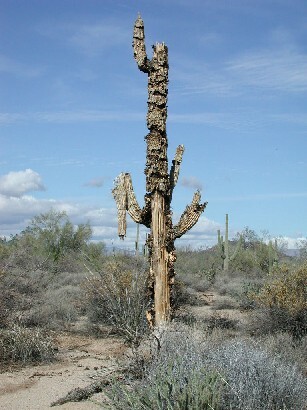 This saguaro was injured in the 1996 McDowell Mountain fire. It may have struggled to survive for several years before infection finally killed it. The skeleton may stand another decade or two before the support roots are sufficiently weakened by termites and soil fungi to permit toppling by the wind. In the mean time it offers refuge to beetles, spiders, scorpions, and bees. Photo taken December 1st., 2002. The fire removed virtually all vegetation from the surface of Lousley Hill in 1996. But now an abundance of brittle bush covers the hill side. Photo taken December 1st., 2002. The after-burn habitat seems to be very favorable to these birds. common to abundant winter birds with conspicuous white-striped head. Tiny birds, barely larger than a hummingbird. Drab gray brown with a majestic yellow head. Very common little birds which frequently give spirited high pitched trills while perched atop prominants. Their drab gray and brown color blends perfectly with the desert colors. Common Raven -- Corvus corax - W,Sp Conspicuous, large, jet black birds that soar above looking for food. 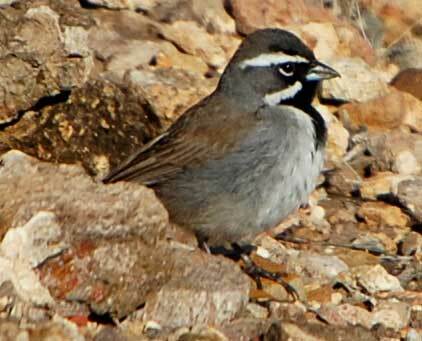 Black-throated Sparrows have distinctive facial markings. Whitethroat Woodrat -- Neotoma albigula - a huge pile of teddy bear cholla joints at the east end of the Lousley Hill ridge top represents the nest makings of many generations. 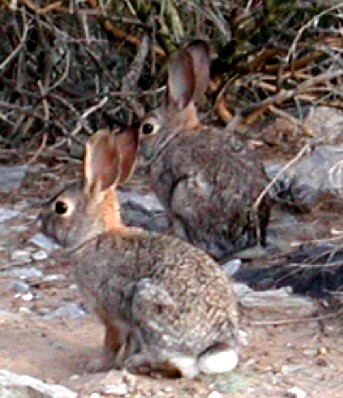 Audubon's Cottontail may be more abundant because of a shortage of predators such as rattlesnakes. Compass Barrel Cactus (Ferocactus acanthodes) -- Spines tinged with red and yellow. Most common species listed first. Brittle Bush (Encelia farinosa) -- Leafless after drought or frost. Leaves are silvery green and flowers are bright yellow. Triangle-leaf Bursage -- Ambrosia deltoidea -- The most common plant especially on the flats and shallow slopes. Often leafless after periods of drought or hard frost. Creosote Bush (Larrea tridentata) -- dark evergreen shrub with shiny, resinous leaves and ashy or dark wirey twigs. Wolfberry -- Lycium exsertum - the red berries are sweet and edible. Desert Mistletoe (Phoradendron californicum) - Parasitic shrub growing upon various desert trees including Palo Verde and Ironwood. 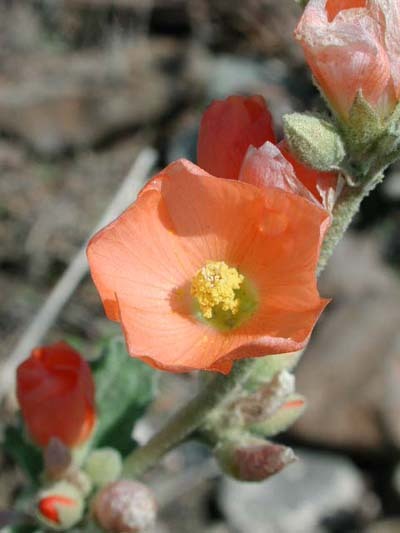 Desert Globe Mallow flowers vary considerable in color. Hackberry Butterfly, Painted Lady, Desert Orangetip, Sara Orangetip, Marine Blue, Checkered White Butterfly. March 8th, 1998 & Feb. 25, 2017. A wildfire burned a large portion of the McDowells in 1996. Many beautiful saguaro cactus and desert trees were killed and the local media hyped the event as a total ruination of the environment. Nature, of course, takes quite a different view. The fire, set by lightning, has simply reset the stage for a magnificent renewal. This spring presents a fabulous wildflower show. And with the wildflowers comes an abundance of insects and seeds, which in turn has attracted flocks and flocks of birds. The habitat is quickly rejuvenating with a different mix of plants and animals.